Combining the elements of a superior compression legging with the sophistication of a street pant, Copper Fit's Energy Capri puts a proprietary Energy Blend™ compression fabric to work on your behalf. 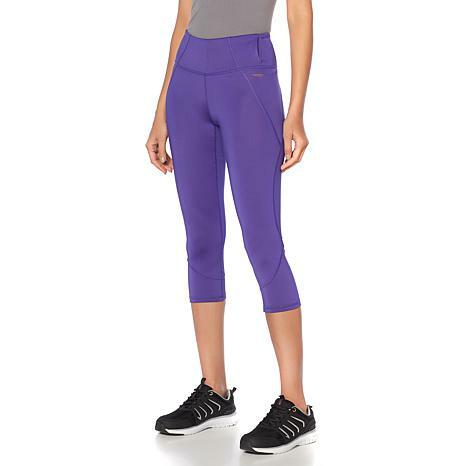 Enjoy full compression in thighs, hips and bottom for a smooth silhouette, plus a high, tummy-smoothing waistband. You get 360-degree range of motion and comfort in a super-sleek black legging for workouts and more. A discreet key pocket comes in handy when you're out on a run. These are the perfect capris for biking. Its wonderful that they fit petites. The fabric is not see-through and has enough strength to hold your tummy in. There is a handy zipper in the back for your valuables. They wash great and the fabric hold up after tons of wear. I love these. I was skeptical and even worried about the sizing, but after wearing these, my sometime weak knee had enough support to enable me to spend more time doing activities around the house. They felt very different from my other yoga pants/capris.They are true to size, COMFORTABLE, and breathable. They are easy to pack too. I love these Capri's. for me at 60 plus years they are great. Comfortable and perfect for active seniors. 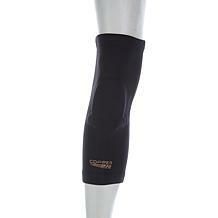 These fit wonderfully and they really helped my legs so they were not extremely overworked and painful. Wished I bought another pair.